This Object of the Week is inspired by SAM’s special tour series, part of “For Freedoms’ 50 State Initiative,” which features programming held at arts institutions across the US to create civic dialogue about the 2018 midterm elections. Reflecting on artwork and exhibitions on view at SAM, staff members are presenting in-gallery tours that consider each of the four freedoms and connect to contemporary society. “For Freedoms,” a collaborative project founded by artists Hank Willis Thomas and Eric Gottesman, is inspired by artist Norman Rockwell’s paintings of Franklin D. Roosevelt’s “Four Freedoms” (1941)—freedom of speech, freedom of worship, freedom from want, and freedom from fear. This week’s post by SAM staff member Rachel Eggers explores freedom of speech in the work of Marsden Hartley. Marsden Hartley (1877–1943) was an innovative Modernist artist, incorporating elements of abstraction, Expressionism, Cubism, and Primitivism in his paintings. Born in Lewiston, Maine, Hartley is known for expressive visions of his home state, including landscapes and portraits of fisherman. But Hartley was more than a regionalist. Perhaps his most intriguing body of work is his “German officer paintings,” created while living in Berlin from 1914 to 1915. SAM has one of these extraordinary paintings in its collection, and Painting Number 49, Berlin is now on view in tribute to the late arts patron and collector, Barney A. Ebsworth, who gifted it to the museum. The painting’s thick brushstrokes, vivacious primary colors, and mysterious abstracted symbolism reveal an artist enraptured and enrapturing, enticing the viewer with a deeply personal vision that melds the physical and spiritual—and, sometimes uncomfortably, the political. Hartley arrived in Berlin in May 1913, though it felt to the artist like a homecoming. The imperial German capital was a hub of industrial innovation and social life; it also had a relatively liberal attitude toward homosexuality. He was delighted by the city’s grand military parades, with their ostentatious display of banners, flags, plumage, and men on white horses. In them, he saw a heroic ideal of Man. He had befriended a Prussian officer named Karl von Freyburg, who may have been the love of his life. When von Freyburg died in battle at the age of 24, Hartley plunged into a deep grief—and eventually to the creation of this fascinating series of paintings. Painting Number 49, Berlin is exuberant, loose, and colorful—but, at its heart, it’s a memorial portrait rendered in abstracted symbols. At the center is the Iron Cross, the medal for bravery that von Freyburg was awarded. There’s an officer’s plumed helmet and epaulets; the number “24” refers to Karl’s age when he was killed. Across the bottom blooms a setting sun, radiating red: the color of martyrdom. The painting bursts with uncomfortable—even heartbreaking—tensions between youth and death, the state and the individual, openness and restriction, color and darkness. Unable to express his sexuality and his love, Hartley turns to a network of symbols and signs. In his unimaginable grief, he merges the physical, the spiritual—and of course, the political—inventing a highly personal visual language. 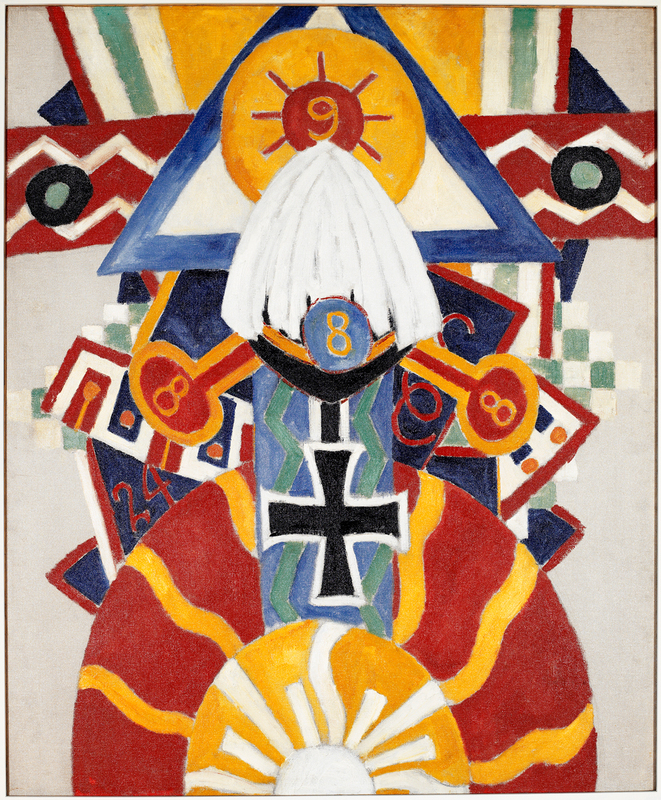 Image: Painting Number 49, Berlin, 1914-15, Marsden Hartley, oil on canvas, 47 x 39 1/2 in., Partial and promised gift of Barney A. Ebsworth, 2001.1067.